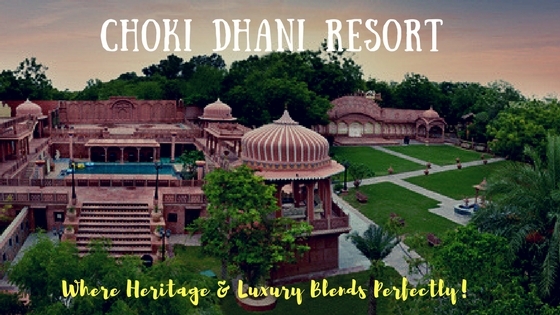 Chokhi Dhani Resort - Where Heritage & Luxury Blends Perfectly! I had totally not expected this, but Rajasthan became my favourite destination in India for monuments replacing other places, even Delhi – known for its architectural monuments belonging to the Moghul era. The opulent Havelis, splendid forts, vibrant bazaars, royal heritage and delectable street food made me fall for Rajasthan the very first time I visited it! 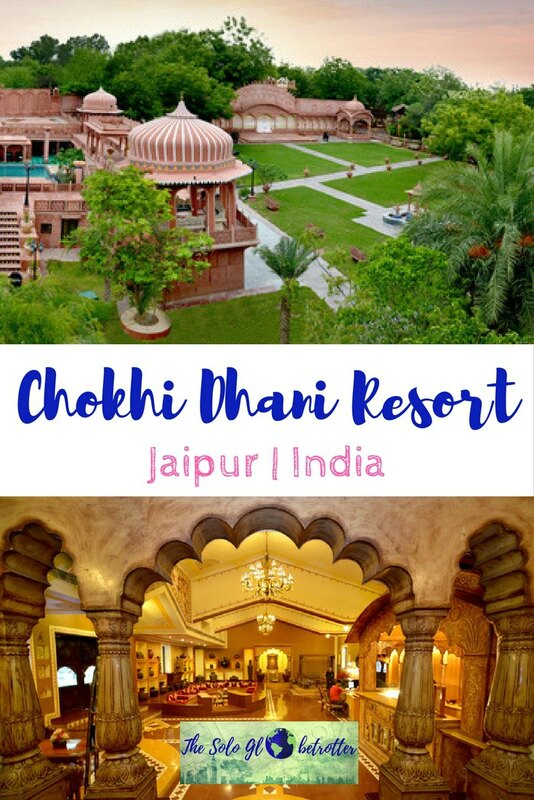 While I was checking out Jaipur’s attractions, I came to know about Chokhi Dhani Resort for the first time from a fellow traveler who had been there and she couldn’t stop raving about it.I mostly stay in hostels, but I love experiencing stays that offer something unique along with just providing an accommodation – may be an experience itself. 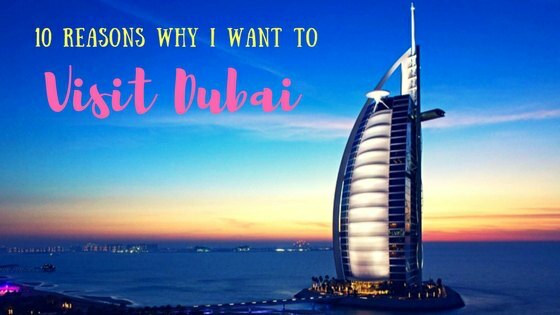 I mostly stay in hostels, but I love experiencing stays that offer something unique along with just providing an accommodation – may be an experience itself. So I got very curious about Chokhi Dhani and checked out the resort online. Guess what? I was instantly drawn to their ethnic experience. So much that I have added this place to my bucket list on my next trip to Rajasthan! 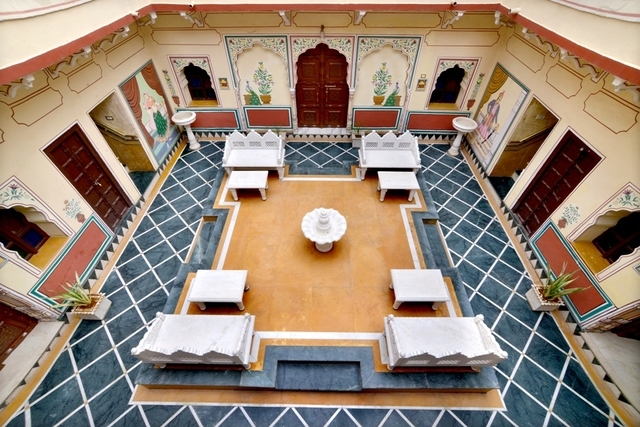 As you know, Rajasthan is synonymous with the elegant Havelis that were once the abode of the royal families (some of them still are). From majestic Raja Mahal in Jaisalmer to the spectacular Sheesh Mahal at Amber Fort in Jaipur, there is no dearth of these magnificent structures. What if you get a chance to experience staying in a place similar to these grand structures? Sounds amazing, right? 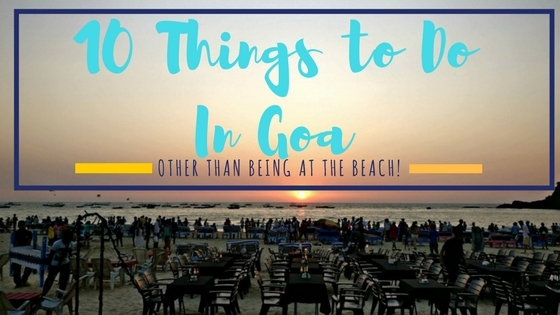 Well, at Chokhi Dhani resort it is quite possible. 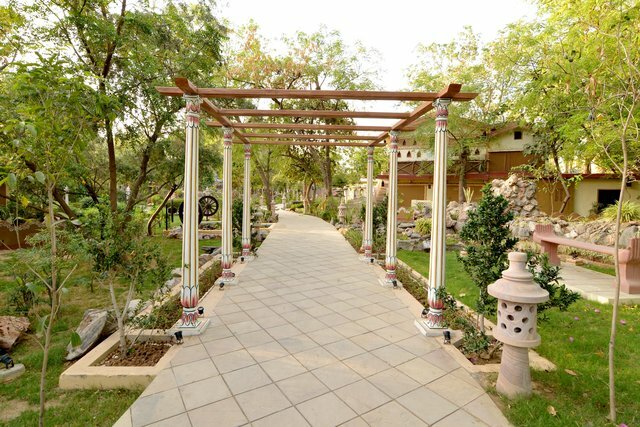 It seems that they have made conscious efforts to offer a royal stay experience in the form of many types of cottages. You can choose from the modest executive cottages to ethnic cottages. 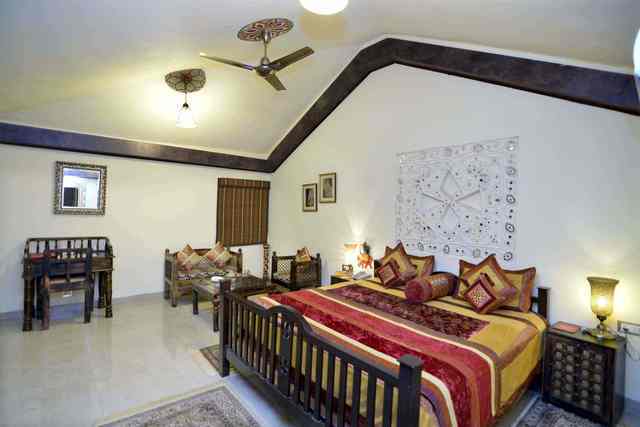 If you wish to pamper yourself you can opt for their royal cottages, royal Suites, Haveli suites. Chokhi Dhani even has exquisite family royal suites and presidential suites. Dola Maru cottages are specially curated stays. These cottages are ethnically designed with traditional frescoes and wall paintings. 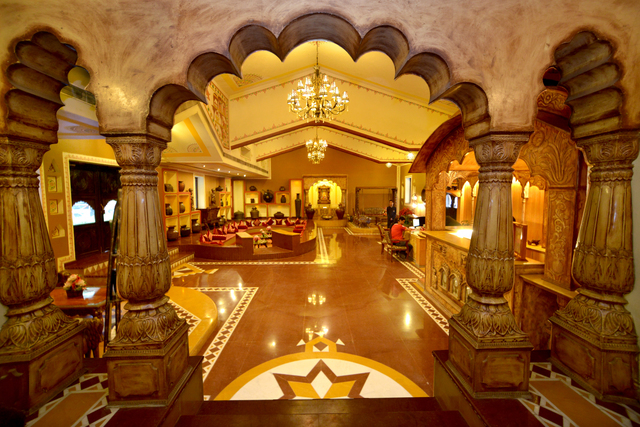 The murals give the antique touch to the grand décor, while the exotic furniture adds to the grandeur. I’m a foodie who never misses trying the local food, even better if it’s street food. Jodhpur stole my heart for street food in Rajasthan, followed by Jaipur where I tasted the best of lassies and Dhoklas! 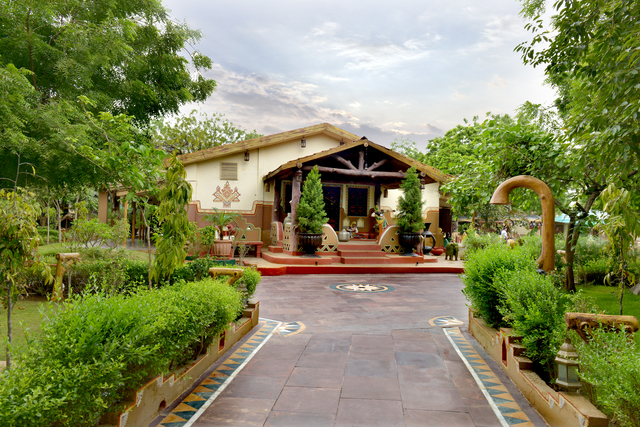 Chokhi Dhani wouldn’t disappoint me after having tasted the delectable Rajasthani cuisine. How am I so sure? Well, just look at the type of themed restaurants they have! If there is the traditional heritage themed Bindola restaurant decorated with Rajasthani Mandana hand wall paintings, there is royal themed Aarogosa especially designed for a luxurious Rajasthani fine-dine experience. Chandi Mahal Lounge decorated with the royal Mughal floral work looks like a perfect place to indulge and party, isn’t it? Chokhi Dhani also caters to folk music and local art lovers. 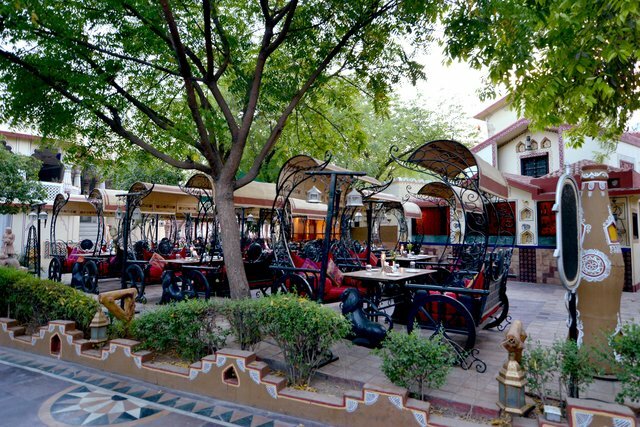 At their Chaupal restaurant, they host enthralling live Ghazal music & traditional Rajasthani art performances. Recommended read: Camping in the Thar Desert – A Night Under The Stars in Jaisalmer! Honestly (and embarrassingly! ), I don’t know to swim! But I love being in the water as long as I’m sure that I won’t drown. So at Chokhi Dhani, people like me can have a fun time too at the ‘Kund,’ their huge swimming pool set amidst a beautiful garden and royal corridors. The spa is the best way to rejuvenate your body and mind, right? Sansha Spa at Chokhi Dhani has this covered. Not just that, I also got to know about their exclusive gym, herbal & Kerala therapies, steam bath and sauna. I know, spoilt for choices again! 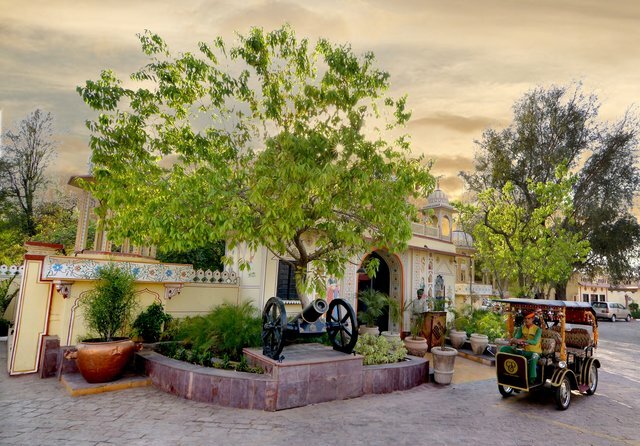 So whether it’s those royal cottages or the Haveli suites or dining in a typical Rajasthani setting savouring authentic cuisines, Chokhi Dhani offers an end-to-end ethnic experience. 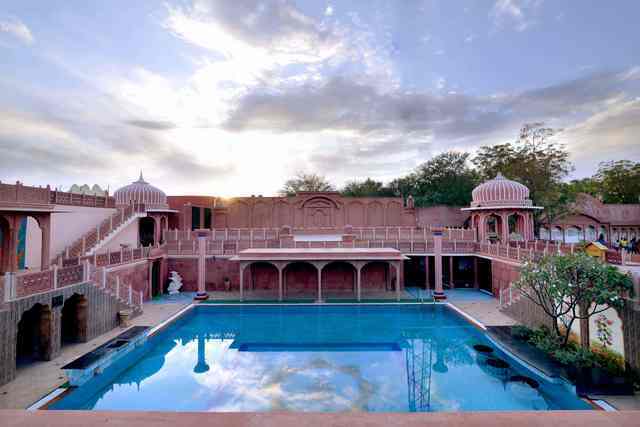 Although I wouldn’t prefer all, I would love to get a glimpse of the royal heritage of Rajasthan at Chokhi Dhani by experience some of these myself! Have you been to Chokhi Dhani already? How was your experience? Would you recommend it to me? Or do you wish to plan a trip to this lavish place like me? 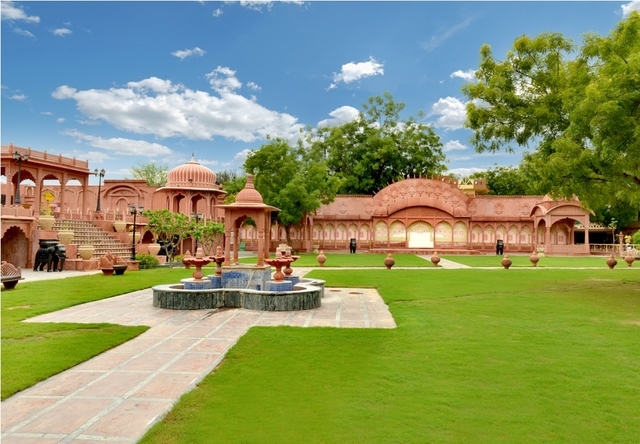 Book your royal experience at Chokhi Dhani Jaipur and have a fabulous holiday.